The navigation was recently updated to make Lovefraud friendlier for smart phones and other mobile devices. Here’s how to find all of Lovefraud’s features. The words in red are direct links. 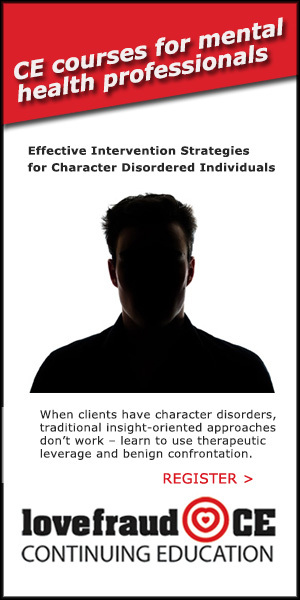 These pages explain the definition of a sociopath, the key symptoms, how to spot con artists, and what can happen when you encounter these predators. You can read the pages in sequence —a link at the bottom of each page takes you to the next topic. Or, you can see links to all the pages at once on the site map. Quiz: Are you a target? Answer these 12 yes-or-no questions. Your score will tell you how vulnerable you are. You realize that you do have a sociopath in your life. Now what? This series will help you determine what to do. 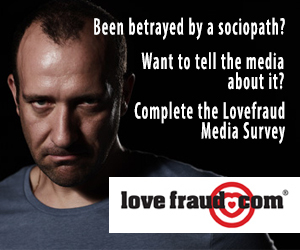 If you’d like to share your story, fill out the Lovefraud Media Survey. Lovefraud posts many of these stories as “Spath Tales” (without any information to identify you). If reporters are looking for a story like yours, we can put them in touch with you. This is the index to Lovefraud’s collection of shocking true stories of unbelievable betrayal. 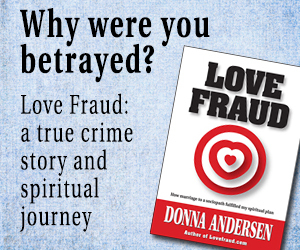 Shop for books to help you understand and recover from sociopaths, including the three books by Donna Andersen, author of Lovefraud.com. Donna Andersen’s self-help book explains the traits and characteristics of a sociopath. You’ll learn how you were hooked, how to escape, and how to keep yourself safe. 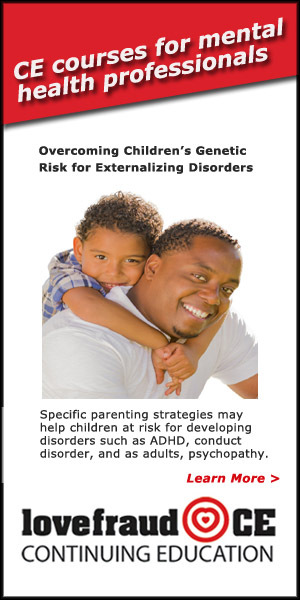 Additional links enable you to read endorsements, the book’s introduction and one chapter. Follow the links to read endorsements, the book’s introduction and one chapter. There’s also a photo album of pictures from the story. Donna Andersen’s videos will help you understand sociopaths and how they manipulate you. 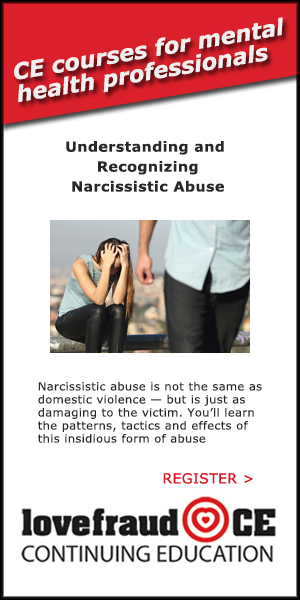 This link will soon take you to Lovefraud’s catalog of online courses. 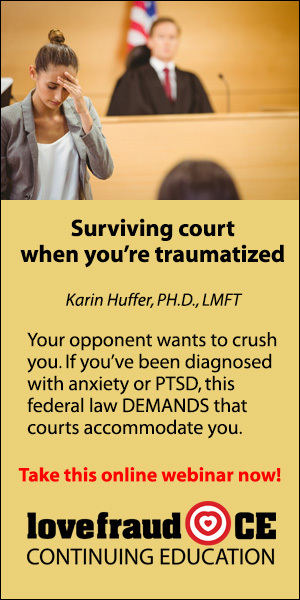 We will offer continuing education courses for mental health professionals, along with courses to help the public understand and recover from sociopaths. The most effective way to prevent sociopaths from ruining lives is education, especially for young people. Donna Andersen is available to speak to high school and college students. 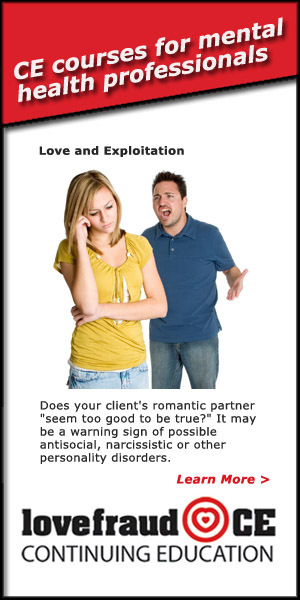 Lovefraud plans to develop cost-effective packages to teach students how to spot and escape exploitative relationships. Help make the program a reality by donating to the Lovefraud Education and Recovery Nonprofit. 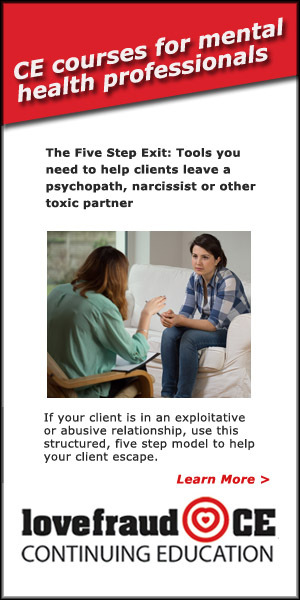 When you need assistance, the Lovefraud Professional Resources Guide is a directory of therapists, lawyers and other service providers who understand sociopaths. 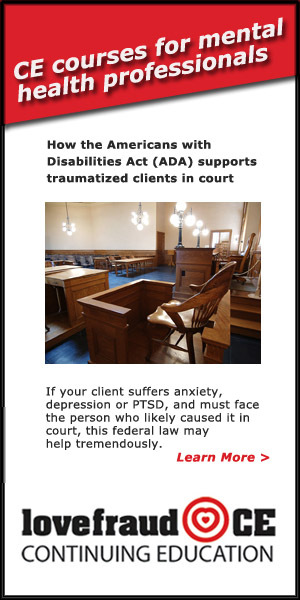 Professionals enable the people who need you to find you join the Resources Guide. Here are contact details for Lovefraud.com. If you need advice about your situation, talk to Donna. 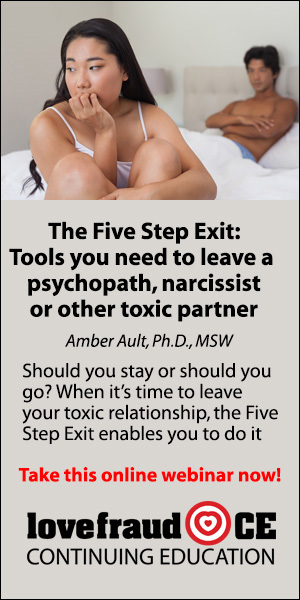 She is not a therapist, but after collecting more than 5,000 cases of people involved with sociopaths, she understands what goes on and can offer you practical suggestions. Translate Lovefraud into 17 languages by clicking the flags under the red menu bar, at the top of the widget column. Here you’ll see the most recent comments readers have posted on Lovefraud articles. If you want to find a particular comment, type in a user name or any search term. Stay up-to-date with Lovefraud articles, announcements and services by signing up for the Lovefraud email list. 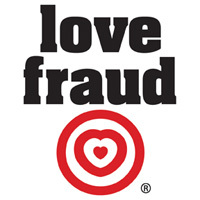 You’ll see the three most recent Lovefraud videos here, with links to the entire collection. To search Lovefraud, type any search term in the box located between the red menu bar and the headline on pages and posts. Before the first comment on your screen, you’ll see links so you can read older and newer comments. To respond directly to a particular comment, hit the reply button. Replies will be nested for a maximum of five levels. If you seen an offensive comment, report it to the administrator. If you want to be notified about comments on a particular post, check the “Notify me” box located directly under the “Submit comment” button. Read about the author of Lovefraud.com here. Information on inviting her to speak to your organization is included. Brief biographies of Lovefraud.com authors. Step-by-step instructions on how to register for Lovefraud so you can post comments. Note: The email list and blog registration are two different databases, so you need to sign up for them separately. You’ll also find Guidelines for comments, along with Lovefraud’s statement on Spiritual recovery. Lovefraud’s content is copyrighted, so you may not republish it without written permission. However, you are welcome to link to any page or post. There’s even a button you can download. 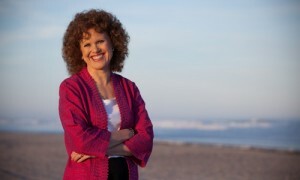 Donna Andersen has made multiple television and radio appearances, and has been quoted in many articles. Go back to the old interviews they’re full of great information. Lovefraud’s press kit and past press releases, including tip sheets and images. Another link that enables you to join the Lovefraud email list. A guide to Lovefraud’s contents, which you are reading now. Here’s where you can find a list of links to all Lovefraud pages. This is especially helpful for finding articles with basic information about sociopaths. Lovefraud has about 3,000 blog posts, with more added every week. Here’s where you find the most recent 40 articles in every category, listed in reverse chronological order. If you want to dig deep into the archives, here’s where you’ll find all Lovefraud’s posts, organized by month and year. Links to Lovefraud on Facebook, Twitter and Youtube. 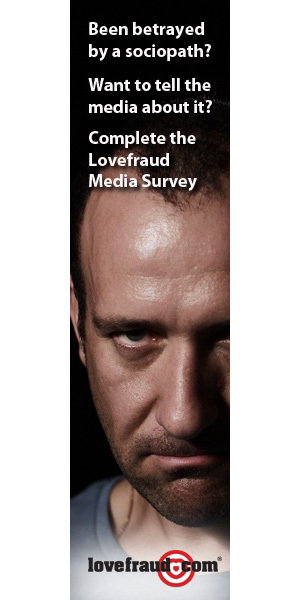 If you want to post comments, click this link to register for the Lovefraud blog. Play the “Are you a human?” game, which prevents spam registrations. Once you’re registered, log in with this link.